While solo vocal recitals of music from Handel’s operas are in abundance, similar programmes of airs from a variety of Rameau’s stage works are very rare indeed. To my certain knowledge - always a dangerous and provocative claim - there have been only four in the past 60 years. In 1952 Nadia Boulanger directed a sequence of operatic excerpts which I still treasure (Brunswick AXTL 1053). 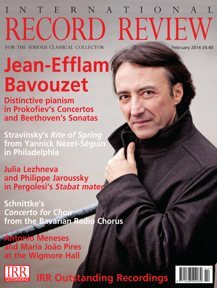 Then, nothing similar for over half a century until in 2004 soprano Carolyn Sampson sang airs from seven Rameau operas in a rewarding programme directed by Jeffrey Skidmore (Hyperion, reviewed in June 2004). Two years later came a similarly varied menu, this time with haute-contre or high tenor Jean-Paul Fouchécourt (Naxos 8.557993). Most recently, until now, that is, appeared a recital of soprano and bass airs from Zaïs and Zoroastre (Alpha ALPHA142). 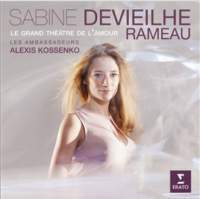 The new release, subtitled ‘Le Grand Théâtre de 1’amour’, features the young French soprano Sabine Devieilhe with Le Jeune Choeur de Paris and the orchestral ensemble Les Ambassadeurs directed by Alexis Kossenko . Devieilhe herself remarks that their programme is conceived along the lines of a small-scale opera, and so it is with a diversity of airs, choruses, dances and an ouverture which, contrarily, is not the first but the third item on the agenda. Three numbers clim to be world premiere recordings. Two of them, a ‘Contredanse’ from Les Fêtes de l’Hymen et de 1’Amour and the air ‘Tendre amour’ from the earlier 1754 acte de ballet Anacréon, may well be, but the air ‘Pour voltiger dans le bocage’ from the comédie-lyrique Les Paladins is not, and may be heard in Jean-Claude Malgoire’s 1990 recording of the work (Pierre Verany PV790121/22). Having got that peppery piece of pedantry out of the way I have little but praise for a captivating disc which reveals Rameau in all his varied and colourful finery. Devieilhe has a light and airy voice and an athletic technique with which to do justice to the composer’s many technical demands. Several of the pieces segue into each other, usually but not invariably convincingly. Much of the music will be familiar to seasoned Ramellians but even they will probably find something novel and unfamiliar. Among the best-known pieces are those from the opera-ballet Les Indes Galantes, the comédie-lyrique Platée and the tragédies-lyriques Hippolyte et Aricie and Castor et Pollux from which Télaïre’s sublime air ‘Tristes apprêts’ happily has been chosen. Devieilhe sings it with mournfully affecting inflections as she does also in a shepherdess’s air from the pastorale-héroïque Nais, Chloé’s touching ‘Tendre amour’ from Anacréon, and Zélidie’s sorrowful ‘Coulez mes pleurs’ from the pastorale-héroïque Zais. It is in laments such as these that Devieilhe, with her ability to sustain a phrase and by her carefully controlled use of vibrato as an ornament, excels. In three items she is joined briefly by tenor Samuel Boden and baritone Aimery Lefèvre . The two pieces with chorus are taken from Les Indes Galantes. Any reader hitherto uncertain as to whether Rameau’s music is or is not for him or her is likely to have any lingering doubts dispelled by the bewitching enchantments cast by an excellently chosen programme sung and played with affection, vitality and an apposite stylistic sense. A winner! Full texts are provided in French, English and German and the recorded sound is sympathetic.